The creation of interior spaces is a creative work that transforms buildings into works of art. The correct choice of materials and solutions allows creating genuine spaces that are adapted to your lifestyle and taste. RenoBuild has, in its showroom, a wide range of samples that allow viewing the multiple possibilities for refurbishments to be implemented at your home for interior remodelling. Gypsum board or wallboard, commonly known as plasterboard, is a material used mainly to make Drywall Partitions and Form Suspended Ceilings, giving a fundamental input for interior refurbishments. Their polyvalent nature, speedy application, easy execution and quality of finish make gypsum board plates a growingly common product in the construction of interior division and the coating of walls and ceilings. The boards re manufactured industrially through a continuous lamination process of a mix of gypsum, water and additives between two cardboard blades. The false ceilings and light dividing wall system have a range of solutions, allowing high thermal and acoustic performances, resistance to fire, humidity and impact. Besides these advantages one may apply all types of finishes and decorative details. 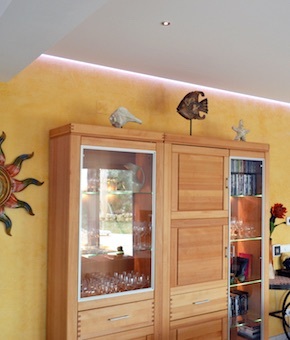 The use of decorative finishes and decorative plasters in interior refurbishments allows creating exclusive spaces. 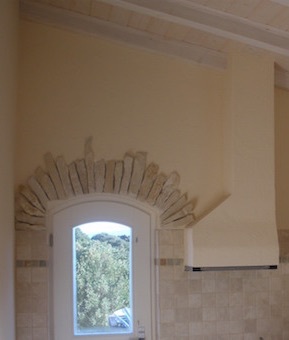 Venetian Stucco: Venetian Stucco, Venetian plaster, Marmorino is a final mortar finishing based on lime. Finishing plasters based on lime marble dust result in a soft and smooth touch, following the Venetian tradition. They may have more or less bright depending on the size of the lime grain and the remaining components. Surfaces are permeable to water vapour, thus preventing condensations and fungi. Decorative Plasters: there are several types of finishing plasters that allow creating decorative effects. According to the utensils used, the reliefs and decorative effects may be very different. Traditional mortars to coat walls and ceilings are named according to the binders included in them: Lime mortars; Cement mortars; Cement and Lime mortars; Lime and Gypsum mortars. Clay is a very hygroscopic material with a great capacity to absorb or release water vapour, until it reaches a balance with its surroundings. This is the most important input of clay for the quality of interior atmospheres, working as a permanent regulator of humidity. Thermal insulation is crucial to guarantee the thermal comfort of the house, during the whole day. In renewal works it is not always possible to intervene on façades (exterior intervention). In effect, for reasons of maintenance of the alignment with adjacent constructions, or in the case of facades with an architectural value, the only way of improving the thermal efficiency of buildings is from the inside. Internal thermal insulation systems are composed of a material with thermal insulation (mineral, vegetal or synthetic) and an interior element, aimed at granting mechanical resistance for ulterior application of desired coatings (plaster, painting, decorative finish, wallpaper, etc.). Acoustic comfort implies not only the type and form of application of building materials used as the analysis of positioning, orientation and conditions existing around a building. It is possible to quantitatively materialise this acoustic comfort with a set of indexes that must meet certain stipulated limits. Taking into account the intervened space, the demands essentially affect the following fundamental aspects: Insulation to aerial sounds of vertical (division walls and facades) and horizontal elements; Insulation to percussion sounds of horizontal dividing elements; improvement of the acoustic conditions of a space (reducing echo); and noise from equipment and installations. 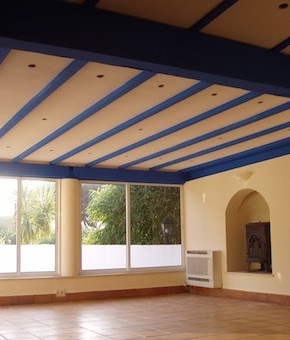 The acoustic insulation solutions depend on the type of sound to insulate, the acoustic correction to be carried out and the surrounding space. Many acoustic solutions also allow improving thermal performance.